Everything you need to know about Giuseppe Verdi - the greatest Italian opera composer of the 19th century. Still performed all around the world, Verdi's works are among the greatest hits of the past 150 years. 1. When was Giuseppe Verdi born? Giuseppe Fortunino Francesco Verdi was born on 9 or 10 October 1813, in a village near Busseto, which was then a part of the First French Empire. His given name, registered in French, was Joseph Fortunin François. When he was still a child, young Giuseppe enjoyed educating himself at the large library belonging to the local Jesuit school in Busseto. He also received his first lessons in composition. 3. Did Verdi study music? Verdi went to Milan when he was 20 to continue his studies. He took private composition lessons while attending operatic performances and concerts, often of specifically German music. He gave his first public performance in Bussetto in 1830 at the home of Barezzi, a local merchant and music lover who had long supported his musical ambitions. Barezzi invited Verdi to be his daughter Margherita's music teacher, and the two soon fell deeply in love and married. Margherita gave birth to two children, Virginia and Icilio. Both died in infancy while Verdi was working on his first opera and, shortly afterwards, Margherita died aged only 26. Verdi was devastated by their deaths. The production by La Scala Milan of Verdi's first opera, Oberto, in November 1839 achieved a degree of success, after which La Scala offered Verdi a contract for three more works. It was while he was working on his second opera, Un giorno di regno, that Verdi's wife died. The opera was a flop and the composer vowed to give up composing forever. However, he was persuaded to write Nabucco - with its famous Chorus of Hebrew Slaves - and its premiere in March 1842 made Verdi a star. Pictured is a 2011 production of Nabucco at the Washington National Opera. Verdi's predecessors who influenced his music were Rossini, Bellini, Giacomo Meyerbeer and, most notably, Gaetano Donizetti - pictured - and Mercadante. With the exception of his operas Otello and Aida, it is said that Verdi was free of Wagner's influence. Over the next decade and a half, Verdi wrote 14 operas in all. 'From Nabucco, you may say, I have never had one hour of peace,' the composer said, describing his life as 'sixteen years in the galleys.' In 1847, he revised his opera I Lombardi, and renamed it Jérusalem. It was produced by the Paris Opera and became Verdi's first work in the French Grand opera style. Pictured is a press illustration of Act 3 of Verdi's opera Jérusalem, first performed on 26 November 1847 by the Paris Opera at the Salle Le Peletier. Sometime in the mid-1840s, Verdi fell in love with soprano Giuseppina Strepponi who was to become his lifelong companion. Their cohabitation before marriage was regarded as scandalous at the time. After his mother's death in 1851, they made the Villa Verdi at Sant'Agata in Villanova sull'Arda their home. They married on 29 August 1859 near Geneva. Probably Verdi's greatest masterpiece, Rigoletto, was premiered in Venice in 1851. Based on a play by Victor Hugo, the libretto had to undergo substantial revisions in order to satisfy the censors, and the composer was on the verge of giving it all up a number of times. The opera quickly became a great success. Pictured is a 1976 Bavarian State Opera production of Rigoletto, directed by Roman Polanski, starring Vasile Modoveanu as the Duke and Peter Glossop as Rigoletto. Between 1855 and 1867, Verdi was unstoppable. There was a great outpouring of operas, among them Un ballo in maschera (1859), La forza del destino (commissioned by the Imperial Theatre of Saint Petersburg for 1861 but not performed until 1862), and a revised version of Macbeth (1865). The pictured artwork shows Luciano Pavarotti in a 1980 production of Un ballo in maschera. After Italy was unified in 1861, many of Verdi's early operas were re-interpreted as works with hidden Revolutionary messages that probably had not been intended by Verdi. Spreading throughout Italy in the 1860s, the slogan "Viva VERDI" was used as an acronym for Viva Vittorio Emanuele Re D'Italia - Long Live Victor Emmanuel King of Italy, referring to Victor Emmanuel II, pictured, who was then king of Sardinia. It took Verdi's publisher ten years after the success of Aida in 1871 to lure Verdi out of retirement and persuade him to consider a libretto for an opera based on Shakespeare's Othello. The result - Otello - is considered by many to be Verdi's greatest tragic opera, containing some of his most beautiful, expressive music and some of his richest characterizations. Here, Placido Domingo is seen as Otello in the 1979 Metropolitan Opera production in New York. Verdi's final opera, Falstaff was based on Shakespeare's The Merry Wives of Windsor and Henry IV Part I. It was a huge international success and has long been an admired favourite for its inventive composition, brilliant orchestration and dazzling libretto. Here, Bryn Terfel performs the title role of Falstaff with Patricia Racette as Alice Ford at the 2005 Metropolitan Opera production in New York. 19. 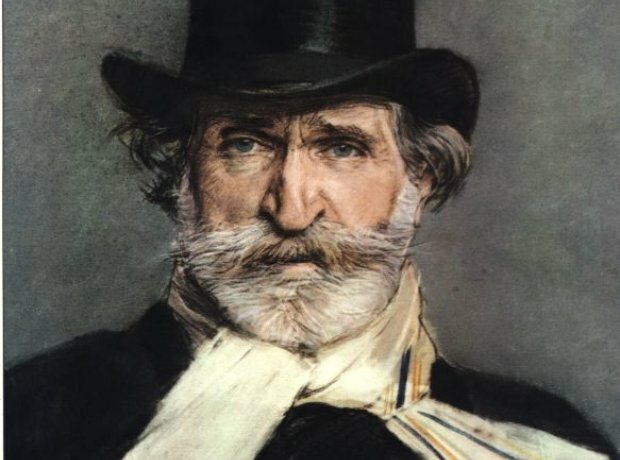 When did Verdi die? Verdi was initially buried in Milan's Cimitero Monumentale. A month later, his body was moved to the crypt of the Casa di Riposo per Musicisti, a rest home for retired musicians that Verdi had recently established.